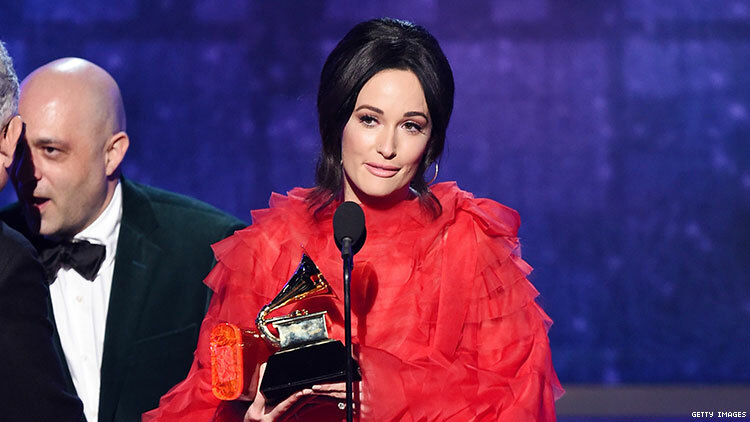 Musgraves’ ‘Golden Hour’ took home Album of the Year at the 2019 Grammys. Yeehaw, girls and gays, Kacey Musgraves has taken home the top prize at the 2019 Grammys, winning Album of the Year for country crossover Golden Hour. Take that, #GrammysSoMale! One year after a ceremony that almost completely shut out female artists, the Grammys’ most coveted award was snagged by high femme tornado Musgraves, a vocal LGBTQ+ ally (and RuPaul’s Drag Race guest judge) whose pop-infused country record was one of our favorites of 2018. Musgraves, who also won for best country album, beat out Cardi B’s Invasion of Privacy, Brandi Carlile’s By the Way I Forgive You, Drake's Scorpion, H.E.R's H.E.R., Post Malone's Beerbongs & Bentleys, Janelle Monáe's Dirty Computer and the Black Panther soundtrack. "Oh my god, it was unbelievable to be in a category with such gigantic albums, brilliant works of art," Musgraves said while accepting her award, wearing a stunning red Valentino number. "Life is tumultuous right now, and because of that, art is really thriving. I'm very lucky to have a trustworthy team who are honest with me. I love my husband so much and this album wouldn't have been created without you." With her gay icon status confirmed, Musgraves’ win is a win for queers...but Brandi Carlile was still robbed. And Janelle. And Cardi. Stream Invasion of Privacy on Spotify!